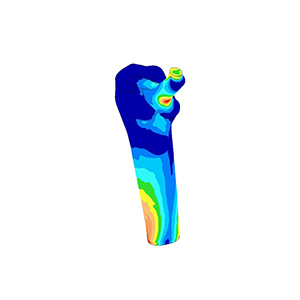 FEA-Solutions (UK) Ltd - Finite Element Analysis For Your Product Design | 280: Hip Joint Implant Stress analysis of hip joint implant including detailed bone representation. Ten versions of the implant have been compared, with different assumptions for the bone to represent variations amongst the population. Project included research on bone material properties.